Available in eight vivid and eye-catching exterior colors, such as Deep Blue Pearl, Chicane Yellow, Gun Metallic and Solid Red, finding a 370Z that matches your style is easier than ever. Available on the 2017 370Z are illuminated kick plates that do more than protect your front sills. The kick plates have been designed to match the door openings and feature a brushed-aluminum insert with an illuminated Z® logo. Also available on the 2017 Nissan 370Z is a rear decklid spoiler. The spoiler will add to the already-aerodynamic body of the 370Z, as well as heightening the vehicle’s style. The 2017 370Z is capable of cranking out 332 horsepower and provides an amazing 55/45 weight distribution. On the inside, the 2017 370Z has a large rear cargo area that is more than big enough to store the more important things in your life – like your set of clubs. 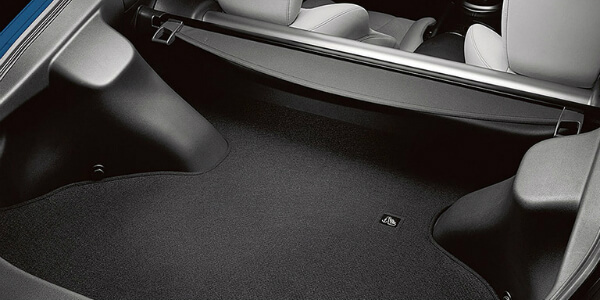 A retractable cargo cover helps to keep the items in your trunk out of sight, and for even more protection, a hidden compartment has been placed behind the passenger’s seat to help conceal your most treasured and valuable belongings. The interior of the 2017 Nissan 370Z has been expertly crafted with a three-layer design in order to help you feel perfectly at home every time you get behind the wheel. Actually, you’ll probably end up wishing the seats in your actual home were as comfortable as the seats in your 2017 370Z. 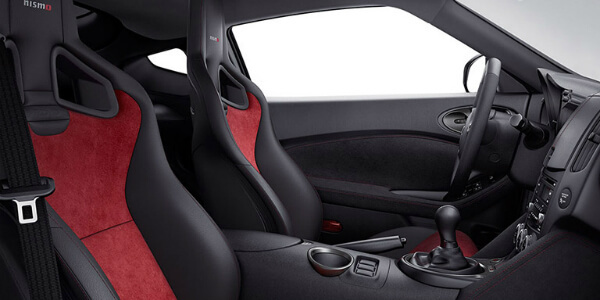 Created with anti-slip material, the seats will hold you in place while you enjoy the amazing driving experience that only a 370Z can offer. Available on the 2017 Nissan 370Z is SynchroRev Match® technology which is able to monitor the clutch, shift lever, and vehicle speed to give you a seamless transition each time you shift gears. When you downshift or upshift, the system is able to “blip” the throttle to the ideal engine rpm which gives you a smooth ride. For those who which to feel a more traditional shifting experience, simply press a button to turn the shifting off and feel the power at your fingertips. For those who would like a little bit more out of their vehicle, the 2017 Nissan 370Z Nismo Coupe has upgraded power and handling transforming the 370Z from a sports car into a supercar. The engine on the 370Z Nismo utilizes a Variable Valve Event and Lift (VVEL®) technology as well as a free-flowing dual exhaust system to reduce any back pressure and increase the high-end power that is produced. By now you’re probably dying to check out the 2017 Nissan 370Z for yourself, and we don’t blame you! Come on down to our dealership here in Palmdale where you can get a first-hand look at not only the 2017 370Z, but at all of our impressive Nissan vehicles. If you already know that you’re going to want to get behind the wheel of the 370Z, that’s great! You can schedule a test drive right here on our website. Simply choose a time and day that fits your schedule the best and we’ll make sure the keys are ready for you as soon as you step out of your car.